THE TAO OF BOW WOW: Film Festival highlights Joy of dogs! By Tanya Ishikawa TELLURIDE/RIDGWAY–Squirrel. Just the sight of this little fuzzy creature can send a dog running off in hot pursuit – even a dog who is a seasoned film star. Lily, a lovable, little Jack Russell, is one of the furry, four-legged leading ladies in the Bow Wow Film Festival, which comes to our area this week. Her best friend and co-star, Ross Downard, said she knows what to do when the camera is rolling. “She is not difficult because she loves to chase bikes and this is her just doing what she does all the time and loves. The occasional squirrel in the woods would delay production from time to time,” he added. Lily, a lovable, little Jack Russell, is one of the furry, four -legged leading ladies in the Bow Wow Film Festival, which comes to our area this week. Courtesy photo. 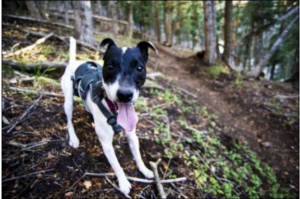 The fleet-footed canine appears in the film short, “Lily Shred 2.0”, a thrilling, trail adventure following her as she races after Downard on his downhill mountain bike ride. Courtesy photo. One such selection is “Denali – No easy way to say good bye” by Felt Soul Media, a “bite-sized” production company based in Salida and Denver, Colorado. This relaxing but intense nearly eight-minute movie tells the story of the relationship between Denali and his best buddy, photographer Ben Moon. Set in many breath-taking landscapes, the cinematic beauty is complemented by a touching narration from Denali’s perspective. Another film that tugs at the heart is “Unconditional Stories: Ol’ Red & Laura” produced by documentary filmmaker Kacey Klonsky of Portland, Oregon. The two and a half minute movie is part of a video series about the relationships between people and older dogs in Project Unconditional, a visual storytelling endeavor founded by her mother, Jane Sobel Klonsky. “Lady B’s First Winter” was made in Telluride by local filmmaker Scott Ransom, and tells the story of a Telluride Avalanche Dog’s early life and training. Raised by a husband and wife team of ski patrollers, the yellow Labrador puppy is shown experiencing her first snowfall, first chairlift ride, first snowmobile ride and helicopter drill, as she prepares for her vocation of finding skiers buried under the snow so they can be rescued. Each film demonstrates the joy that dog’s share with the humans who are in their lives. Downard, who made Lily Shred 2.0, described his own reaction to watching her and seeing “how she shreds the trail and sometimes mimics what I do” as awesome. He hopes to produce another Lily film in the next year or so. “My message is just pure happiness,” he explained. “My hope is that the films make people smile, and more people will want to get outside and do adventurous activities with their dogs.” Getting to the Bow Wow Film Festival: The festival begins at 6 p.m. on Thursday, Aug. 20 at the Sheridan Opera House, 110 N Oak St, Telluride, and at 7 p.m. on Friday, Aug. 21 the Sherbino Theater, 604 Clinton St., Ridgway. Tickets are $12 in advance, $15 day of show, and $7 for children under 12. For advance tickets, visit the Second Chance Humane Society Thrift Shops in Ridgway and Telluride or go online to bowwowfilmfest.com. For information, visit adoptmountainpets.org or call Second Chance at 970- 626-2273.